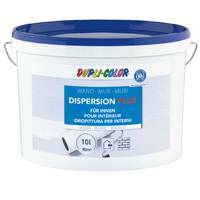 DUPLI-COLOR Interiour Dispersion PLUS is absolutely poor in bad odour and pleasant to use. The paintings stand out by high coverage, enormous efficiency and adhesion and high wash resistance. 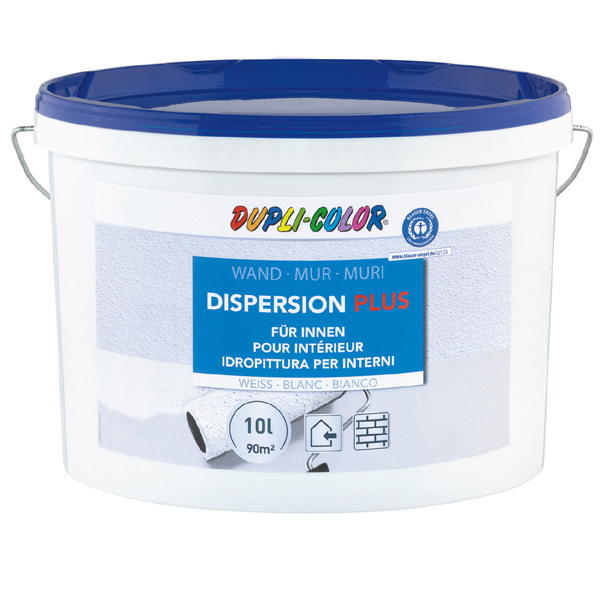 Possible substrates are: masonry, cement, chalk and synthetic plasters, concrete, gypsum, wallpapers, dispersion paintings. Cover floors and furniture with a foil. Mask off windows and door frames with a masking tape. Test the subsoil - it must be firm, dry, clean and stable. In case it changes colour to dark during the test with a humid sponge, a primer is necessary. Old paintings of glue-bound distemper and chalking surfaces must be completey washed off. If necessary, prime with a deep ground. The colour is ready-to-use and has only to be stirred up carefully. It should not be worked if object and working temperatures are below 5°C. Can be brushed, rolled or sprayed airless. In case of different, contrast-rich and absorbing surfaces it can be a previous coating necessary, diluted with max. 10 % water. First paint the corners and edges with a brush or an small roller. Then paint the remaining area with a bigger roller. In working pauses wrap the brush and roller tightly with a plastic foil. After work clean the working tools with water. This colour can be recoated after approx. 4 hours.